Feeling drained and sluggish? The Energy Bundle can get you feeling fresh and energetic again through simple supplements you can incorporate into your daily life! These energy boosters will support your weight loss goals and give you just the boost you need. Supplementing your diet with products designed to boost your energy and support your weight loss goals is a simple way to beat the afternoon slump. 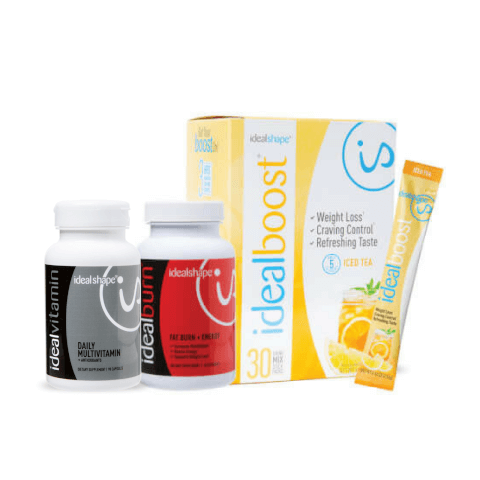 IdealShape’s Energy Bundle will help you have the energy to crush your workouts while controlling your appetite. Drinking lots of water is a great way to start living a more healthy lifestyle, but you might be missing the energy you get from sodas or energy drinks. IdealBoost mixes right into water and can help you feel energetic, while also controlling your appetite for up to three hours! Your workouts might be dragging because you have absolutely no energy. IdealBurn can boost your energy up so you can absolutely crush your workouts. You can even support your fat loss with IdealBurn! Did you know that feeling sluggish and tired could mean you have a nutrient deficiency? IdealVitamin provides all the necessary vitamins and nutrients that your body needs to stay healthy, with B vitamins to provide energy!